Like his 2011 feature debut My Week with Marilyn, Simon Curtis’ new film is based on a true story. You won’t find the likes of Marilyn Monroe or Sir Laurence Olivier here, though. Woman in Gold tells the story of Maria Altmann, an Austrian who escaped her native country in the build-up to World War II, leaving behind her parents to arrive in America. Her story continues as she takes on the Austrian government in a fight to retrieve several paintings by Gustav Klimt that belonged to her family but were stolen by the Nazis and remained in Austria after the end of the war. Maria, played with characteristic care by Helen Mirren, teams up with young lawyer Randol Schoenberg (Ryan Reynolds), grandson to Austrian composer Arnold Schoenberg. He has little interest in his heritage and initially takes on Maria’s case with dollar signs in his eyes. Curtis’ film ambitiously bounces between Maria's present-day legal travails and flashbacks to her younger self (played by Tatiana Maslany), as she plots her wartime escape with lover Fritz (Max Irons). While art restitution doesn’t always make for the most compelling of subjects, as George Clooney’s lumbering The Monuments Men showed last year, the Mirren / Reynolds partnership propels the film along, with their chemistry lending the sombre storyline some much-needed levity. The supporting cast is also sturdy – if distractingly starry – with appearances by Jonathan Pryce, Elizabeth McGovern and Charles Dance in small roles. 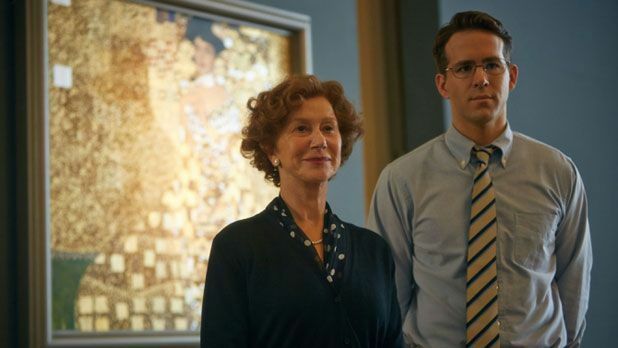 Yet, for all its good intentions, Woman in Gold mishandles its narrative. Other flashbacks, including to Klimt creating his famous ‘Portrait of Adele Bloch-Bauer I’ – with his titular muse, a Jewish patron of the arts who happened to be Maria’s aunt – muddle the story further. Curtis’ film stumbles in its digressions, lacking clear direction, along with the emotional impact it so desperately needs. General release from Fri 10 Apr.